Pretty exciting days around here right now. DoRena is getting married tomorrow and we have lots of activity. We're excited, but we're going to miss seeing her every day! We spent this morning making chocolate covered strawberries for the reception. Here's the smiling bride-to-be. Behind her in pink is her future sister-in-law, Bekah, who is marrying her brother later this summer. (Here from Texas.) Her matron-of-honor, Naomi, and baby (due in September) is in purple. Patrick is in the background sipping his coffee. This is good news for those of us suffering from "Issues" withdrawal. If you weren't a fan before, you'll get your chance now. I'm sure there are some people who always order something new when they go to a restaurant that they've been to before. By the time I've been to a restaurant a few times I have favorites. I tend to order from among a few things. Sometimes I'll force myself to try something new, but not too often. So when a favorite disappears from a menu, it's rather traumatic. It happened at Mad Anthony's when they redid their menu. They took away my Seafood Unwrap. Fortunately, many vocal customers let them know they missed it, and it returned to the menu. I've written before about our family trips to Buca di Beppo for special birthdays. We love their food. Eating family style is great fun. But we all always look forward to the end of the meal, because they had absolutely fantastic cannoli. The best ever. HAD. They've gotten rid of the cannoli. So I'm telling everyone I know, "If you like Buca, call and ask them to bring back the cannoli." Hillary keeps whining that sexism is behind her looming demise. Peggy Noonan takes a look at her whining. Just a few key words: insulting, manipulative, untrue, prissy. A cupcake is really just a better tasting muffin, right? Especially when your mom baked it from your grandma's spice cake recipe, right? Thanks for the breakfast mom! It took sitting through two hours of stuff, but American Idol's results show ended with a well-deserved victory by David Cook. The judges love fest last night with David A. made the outcome especially satisfying. We'll be looking forward to David Cook's first CD! I was delighted to discover last night that April Cornell is still around. I didn't realize that after they closed the stored they were maintaining a catalog/internet business. They have some lovely things. Their prices have also moderated a bit since I last saw them. I may be ordering a dress. We finally decided to go ahead and get the family YMCA membership that we've been contemplating for ages. I am looking forward to swimming and eventually joining in some of the classes. There is a fantastic fitness center and the kids and I are going to go for an orientation. So I'll let you know if we actually manage to use our membership. For me, the worst thing about blogging isn't writer's block, or lack of ideas, or even lack of time to write. It is the lost ideas. I'll be driving down the road and a conversation or something on the radio will spark a train of thought. "That would make a great blog post." Or maybe it happens while I'm in the shower. Or at church. But the state of my brain is such that very few of these ideas survive until I get to my computer. Yesterday I was all excited about an idea. I even told my two oldest children that I was going to blog about something. Unfortunately, by the time we got home five hours later, all I remembered was that there was something that I wanted to blog about. I'm trying to find a dress. I don't need anything elaborate. It doesn't have to be especially cheap. I don't have strict requirements for color, style, etc. I just want something that fits. I want a dress that is feminine and flattering, but not overly revealing. I have tried on several that were close. One almost worked. The neckline was too low, but I could have tacked a small piece of fabric into the vee. But the armholes were too large, too, so the sleeves were baggy. I know that I should learn to sew. I'm working on it. But that doesn't get me a dress now. I'm still keeping track of my reading challenge books. The challenge at this point is that my categories don't fit my actual reading patterns. So I need to decide whether to change my patterns or change my lists. I did really enjoy a couple of the books I read this week. Buckingham Palace Gardens by Anne Perry was very enjoyable, as her books always are. Stone Cold by David Baldacci left me ready for the next one, but don't read it unless you've already read the Camel Club and The Collectors. My friend Melody posted about what it would take to make her house her dream house, so I've been thinking about it for the past couple of days. First, this house really can't ever be my dream house. It just isn't right. I'm going to post what my dream house would be without reference to this house. My dream house is a ranch. Aesthetically, I prefer two story houses, but arthritically I prefer ranches. It is either brick or stone. It has a big front porch. (My children and some others will now begin to recognize this house, because it is going to sound a lot like one of my grandparents' houses.) It has lots of windows. It has to have a basement. The basement would have a wine cellar and cold room as well as lots of basement-y space. And ten foot ceilings. We'd have a pool table and bar in the finished part of it. The basement steps would come into the main floor in exactly the right spot. I'll come back to that in a second. The three car garage would enter a mud room/laundry room. This room would be about 16x10 and along with the washer and dryer would contain a space for folding, hanging, and ironing laundry. There would be a large closet with space for jackets, work boots, mowing shoes, and extra clothes for muddy people to change into. There would also be an adjacent bathroom with a stall shower. There would be a desk with a computer and space for keeping the household bills and information on plumbers, piano tuners, etc. This would be connected to the kitchen by a short hallway which would have the entrance to the basement as well as a door to the back yard. The kitchen would be a large--about 30x15--eat in in kitchen. It would have a 6 burner gas cooktop with a vented hood, double wall ovens, and a small prep sink to go with the one big sink. The floors would be easy to clean, heavy duty, attractive, real linoleum. The cabinets would be maple and the counters would be quartz. It would have built-in book shelves and appliance storage. This would flow to a cozy family room with big windows and built-in shelves and cabinets. All of this is in the back of the house. Across the front of the house would be a living room--about 26x15--with a big picture window. The pianos would be in here and one end would be set up as dining room. The house would have four big bedrooms and two more baths. Just normal sized bathrooms, no enormous spa tubs, etc. But both would have double sinks and separate water closets to allow for simultaneous bathroom use by two--or more--family members. They would have vintagey-looking ceramic tile. The first bedroom on the front of the house would go to the lone girl. The room across the hall from it would be my office/scrapbooking/sewing room. It would have a big window with a built in desk/cabinet unit across the whole back of the room. It would have a closet for storage and one wall of bookcases and cabinets for storage. It would have a comfy chair with a little table. There would be enough space for me to open out a big table for sewing and other projects. The two bedrooms at the end of the hall would be ours and the boys. Again lots of windows and plenty of storage. Like the rest of the house--except the kitchen and bathrooms--they would have hardwood floors. The house would sit on about five acres, but still miraculously be within a couple of minutes of church. And the back yard would have a pool, all kinds of fruit trees, rasperry canes, and a big old garden. There would be a shed for Colin to use for his wood projects and his reloader. What's your dream house? If you post about it, leave a comment and let me know. My friend RPW has an excellent distillation of the many issues currently facing our synod. RPW is always very thorough, calm, and logical. This post lays the problems out very clearly. Help! My son is nine and he can't read! I've posted before about why we started homeschooling and about some of the difficulties we faced, but the reading issue was a huge problem for us. Patrick couldn't read when he was six. Or seven. Or eight. Or nine. My oldest child had been reading since she was four. When she was in school, she had a hard time getting them to let her check books out of the library that she wanted to read, because the librarians didn't believe she could read them. Add to that the fact that my husband and I both come from families that have a lot of teachers and are very conventional. Kids are supposed to read in first grade. End of story. So we started trying when he was six. But he absolutely could not read phonetically. He had to learn all words by sight. He would "learn" a word one day and the next he wouldn't remember it at all. It was frustrating for both of us. Our family had been dubious about homeschooling anyway, and I think that all of them, except for my mom, were sure that I was in WAY over my head. But I knew that he was going to read and read well. He was a very bright little boy. He was fabulous at math, had a huge vocabulary, and a fantastic memory. Then I read a book, that led me to another, and another that began to give me hope. There are a lot of kids, especially boys, whose brains are just not ready at the age of six or seven or even nine or ten for the kind of processing that reading requires. I started talking to other moms who had boys with reading difficulties and had overcome them. I quit trying to teach him to read when he was almost seven. But that doesn't mean we forgot about books. If anything I read to him more. Sometimes he'd sit by me and follow along with a picture book, but more often we read really good interesting books for the whole family and he would just listen. Every once in a while he'd pick up a book and try to read. He also had several books memorzied that he would "read" to his little brothers. He would spend hours poring over the DK Cross Sections Book that he bought with his own money. At nine-and-a-half he was still barely reading. It was getting harder to convince friends and family that things were okay, but for some reason I still felt confident. Shortly before his tenth birthday, many people in our homeschool group were in an uproar over the first Harry Potter book. A group of them even burned it. Well, that convinced me that I needed to read it. Patrick's best friend read it and Patrick really wanted to read it, too. We bought it and Bethany made short work of it, pronounced it "good" and then passed it on to Patrick. I didn't think a lot about it, but a couple of days later I realized that he was carrying the book around everywhere and was actually making progress. And he finished the book. After that, he just picked up speed. 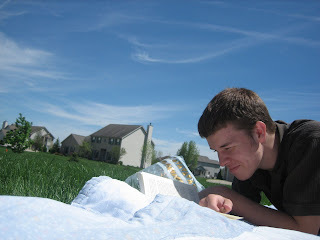 And now, at 17, he reads whatever he wants with good speed and excellent comprehension and retention.He has read many of the great works of western literature. He has read things that I haven't tackled. What worked for him may not work for everyone, but I think it is vital as parents that we trust our instincts. I knew that Patrick was smart, but already in kindergarten he was being pigeonholed as being behind. It would have only gotten worse. I feel sorry for kids who are in school and labeled. All three of my boys would be wearing a closetful of labels if they were in school. But our goal isn't to keep our kids up to some arbitrary school schedule, it is to produce human beings who love learning. For that we don't need labels. I think most of us know that all is not well within the LC-MS.
Go here and here and here for more about just how mixed up the synodical bureaucracies' priorities are. Patrick gets to cast his first votes tomorrow, since he'll be 18 by the general election. Before I tell you this LONG story I need to give you a picture of my son in the present. Patrick is 17. He is a wonderful son. He is mostly polite, respectful, smart, funny, helpful, and loving. He is serious about his faith and loves acolyting at church. He is a voracious reader (currently reading Anna Karenina) and loves politics, movies and sports. I firmly believe that if he had stayed in school, things would be much different. My daughter was finishing third grade and Patrick was finishing Kg when we began to consider homeschooling. We knew we were leaving the school that the kids were attending, and were looking at other options. Patrick had had a horrible experience in kindergarten, socially and academically. The happy, bright five-year-old that we had taken to school in September had become moody and withdrawn. He was teased because he sang too well, colored too badly, and couldn't match the sounds with the letters. He wasn't going to pass kindergarten. We knew that he was smart because of his intuitive grasp of numbers and his incredible vocabulary. But there was no denying that in a school system that decreed that all children would read in first grade, he would be in trouble. I looked at options, and the one that just kept popping back up was homeschooling. I finally decided that I would homeschool him for a year or so, to get him "evened out." Surprise number one: Our daughter--straight-A student and social butterfly--wanted to be homeschooled, too. Since I wasn't thrilled with any of the school options we had, we pulled her out, too. I've chronicled our bad start in my last post, so I won't repeat that. But that truly was just the beginning. It was bad! Patrick was angry. He was mad at me for ever having taken him to school. And the more I heard what that year had been like for both of my kids the more I understood. So I embraced what was for me a brand new concept: We deschooled. We absolutely did nothing that looked like school for over six months. We, of course, kept living, and--as I've learned--that's how we learn best, but there were no workbooks, math problems, spelling words, or drills. We read lots of books, played games, went to the park, watched videos, and went for lots of walks. I spent a lot of that time reading about how kids learn. I was especially interested by the differences in boys and girls in learning to read. 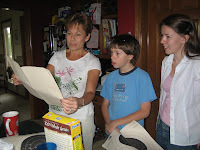 I went from a reluctant homeschooler to a mom who firmly believed that our education system does many kids--especially boys--a huge disservice by trying to force early reading. Okay, they're home. Now what? I am sure that I was not the only homeschool mom asking that question on the first "official" day of homeschooling. Even you parents who have homeschooled from the start have had the moment or moments where you are pulled up short by the realization that you have taken the responsibility for the education of your children into your own hands. I was not completely unprepared when we began this journey 13 years ago. I had read lots of books. I had heard Raymond Moore on the radio. I had ordered hundreds of dollars worth of the curriculum most frequently recommended in the books and magazines that I had found. But the information was a lot more limited than it is now, and I felt unprepared. I didn't know any real-life homeschoolers. I had never actually met anyone who homeschooled or anyone who knew anyone who homeschooled. I come from a family with lots of teachers. Several of my aunts are teachers and so was my mother-in-law. To say that I felt a lot of pressure would be a big understatement! So I did what hundreds of thousands of parents have done. We started. We started with lesson one. And within a month I was sure that we'd made the biggest mistake ever! Remember, I had chosen my curriculum based solely on what was recommended in the most books that I had read. I hadn't seen anything before I ordered it. We hated most of it. My daughter hated Saxon math. My son--who is very freaked out by clowns--had clowns all through his BJU Kg curriculum. As a history major I was totaly underwhelmed by the A Beka history book. And there was lots of theology spread throughout the books that was definitely not in line with what I was teaching my kids. What to do? I had spent hundreds of dollars. I had to have a curriculum didn't I? While I was struggling with this a very good thing happened. I connected to AOL. There was a homeschooling forum with hundreds of other homeschoolers from all over the country. It was like someone had switched on a bright light for me in the middle of a dark night. I didn't have to use a set curriculum? My son needed to deschool? Unschooling? What I learned was that homeschooling is not a one-size-fits-all kind of endeavor. (Actually, I learned LOTS there, but that was just the most important at that point!) We decided to step back from what we were doing. We put the curriculum on the shelf. I asked my then-nine-year-old daughter what SHE would like to learn about. Boy did she have a list! My son--who was the reason we started homeschooling (that's another post)--was really struggling with wanting to learn anything at all. That struggle didn't magically end when we put those clowns in the trash. But we worked on it. I would like to say he came around quickly, but in truth it took years. The answer to the "now what?" is that you begin to learn with them. It may go smoothly and within months they're learning Latin, churning butter, sewing their own matching clothes, and flying through Saxon math. Or it may be rough. There might be tears. You might buy something that doesn't work. You might have a child who needs to be motivated to want to get out of bed or do anything but play Legos. You might want to pull out your hair. But you just keep going. Tweak what needs tweaking. Or maybe throw it all in a closet and start over. I've been spending lots of time lately answering questions about homeschooling. It seems to go in spurts, and this has been a busy time. I get the questions from those considering homeschooling, those who've just started, and those who have been homeschooling for a while but need reassurance. Or sometimes from those who are just curious. So I'm going to revisit a couple of posts from the past, from my first blog. As you will see, we were reluctant homeschoolers. We didn't start for idealogical reasons. We didn't start to keep our kids away from anything. We did it in desperation, because we had a child that school was hurting, and I couldn't see any other way. If I had seen another way, I would have taken it! Now I can't imagine a different life than what we have. Homeschooling has become a way of life for us. I am happily busy getting everything all set up on my new computer.